[Phys. Rev. B 78, 195417 (2008) and J. Phys. : Condens. 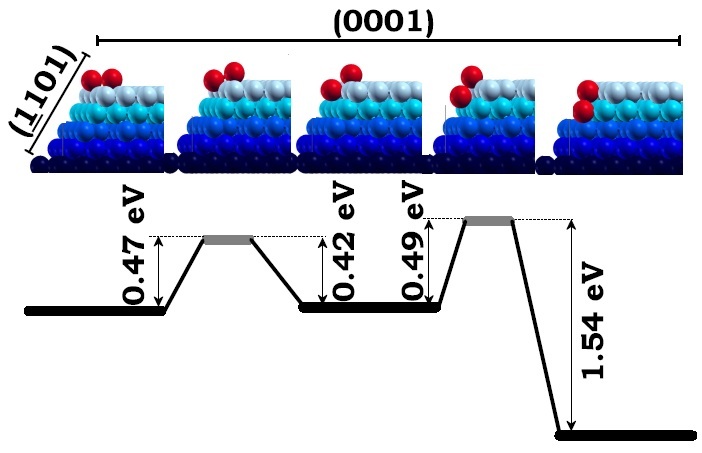 Matter 21, 474226 (2009)] This work focuses on understanding the performance of clean energy conversion nanodevices, proton exchange membrane fuel cells (PEMFCs) in particular. Operation of the anode in these devices consists of splitting hydrogen molecules into protons and electrons and Pt atoms on the anode catalyze such process. Unfortunately, the main source of hydrogen is hydrocarbons, which unavoidably contain carbon monoxide (CO) molecules. CO molecules are undesirable because they severely poison the reactivity of commercially used anodes as they sit on the Pt sites and block them as a result. In the recent past, a new PEMFCs anode was developed and, surprisingly, its reactivity was much less sensitive to the presence of CO. The preparation of such device had given only some clues about the particulars of its structure. The novel anode was in fact a set Ru particles of few nanometers sprinkled with small amounts of Pt. However, in order to understand the mechanism by which this device copes with the above-mentioned traces of CO, it was essential to investigate the details of the atomic arrangement at the surface of the anode. 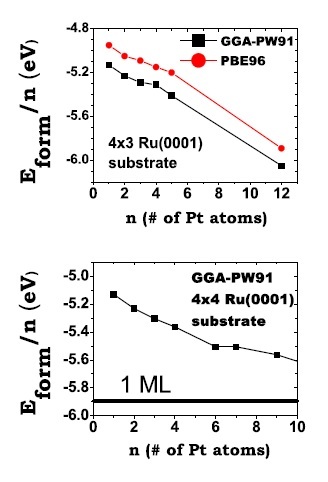 In reference , total energy calculations allowed us to reveal that Pt atoms tend to form two-dimensional islands on Ru, instead of three-dimensional ones. This, in turn, pushed forward an earlier idea: that the enhanced activity of the novel anode was because somehow the undesired CO molecules do not stay on the Pt sites but migrate to Ru ones. Sure enough, in reference  we showed that the atoms forming the 2D islands displayed an electronic-structure profile such that, if a CO molecule somehow reaches the Pt island, it tends to abandon it to reduce the total energy of the system. Moreover, we demonstrated that CO in fact does not stay on Ru sites. Once it reaches the edge of the island, it actually reacts with another molecule commonly present in the reaction environment, OH, oxidizes forming CO2 and desorbs in the gas form. Still, it remained toexplain how few-atom Pt islands could remain as such without aggregating into one big single island, which actually would significantly lower the energy. An analysis of the size, structure and preparation of the Pt-loaded Ru nanoparticles led us to the answer. 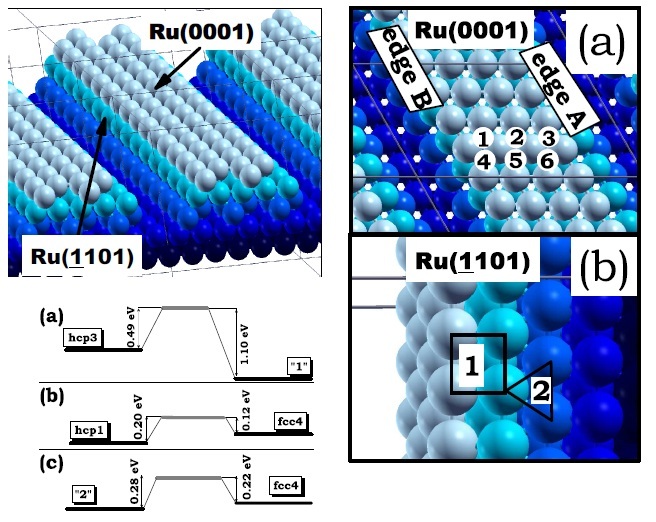 The anode is prepared in such a way that the Pt atoms were distributed on the many facets of the Ru nanoparticles. 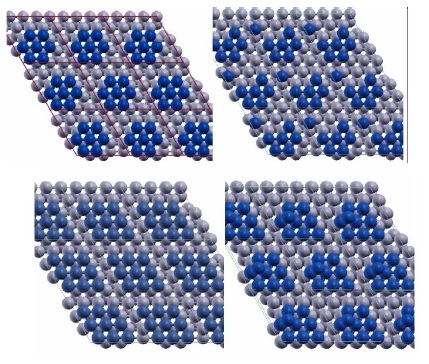 We showed that, although diffusion within a particular island is easily activated at room temperature, the Pt atoms are trapped in the facet they are initially adsorbed on unless they overcome very large energy barriers to diffuse from facet to facet. In this way, we showed that the smallness and faceting of the Ru nanoparticles is an essential factor that allows Pt to remain as small 2D islands, the key feature of the anode that makes Pt protected from CO poisoning.